There are lots of people who dream of becoming authors and seeing their books in the bookstores, but for most of them it remains an unfulfilled dream. Everything Publishing by Karen McDermott has all the tools and techniques that will give readers the details required to start their journey to becoming a published author. Reading this book will make the task seem less daunting and overwhelming, and to make it easier the author has divided the book into two sections. 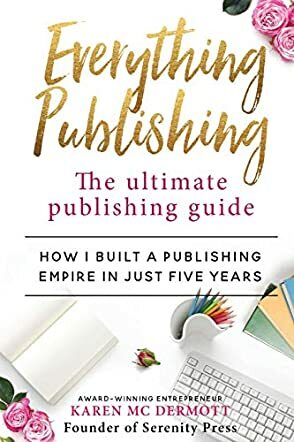 Part One is filled with industry knowledge and Part Two is the author's story of how she built her publishing empire in five years. The topic is well handled and the author's personal stories and experiences make it easy for readers to connect and be confident enough to handle publishing or build their own publishing press. The book will teach readers the basic skills required to publish a book with access to global distribution, how to distribute the books to bricks and mortar bookstores, how to raise the vibration of the book before the launch, how to be resourceful, how to make success possible, and many other factors that are helpful when it comes to publishing. There is a lot of information in this book for all those readers who want to get their work published and become authors. The topic has been handled methodically and extensively, making it easy for readers to use the strategies and tools to get their work published without too much hardship. I like the way the author has put together this book, making it an interactive and engaging guide in which the key elements will help readers embrace their journey with open arms and make their publishing dream a success. I love Karen McDermott's story, and how she created her empire. She is inspiring as a writer and her story is is beautiful.